Building pools is in Jamie Bramich's genes. His father Graeme Bramich was a sought-after swimming pool contractor, and Jamie cut his teeth helping in the business, building complex pool structures alongside his dad. In 2007, with already a decade of pool building experience under his belt, Jamie started designing and building pools on his own. JB Pool Construction has since earned a reputation for delivering projects that are second-to-none and Jamie has become renowned for exceptional service and top-notch workmanship. Every client and every project receives the same level of care and attention, and Jamie Bramich oversees every pool that bears his name. Australian Plunge Pools is a Prefabricated pool manufacturer distributing a unique product to the Australian Pool and Hydrotherapy market. Manufacturing is completed in our factory on the Gold Coast in Queensland and each pool is custom made and distributed throughout Australia. As a pool maintenance and pool cleaning company we understand that not everyone has the time or inclination to maintain their pool in pristine condition. 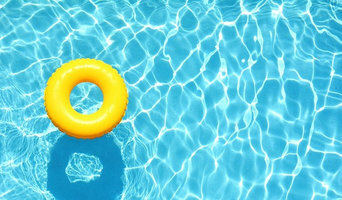 Cozy Pool and Spa Care is a new division of Cozy Pools, providing all your pool and spa maintenance – Gold Coast. 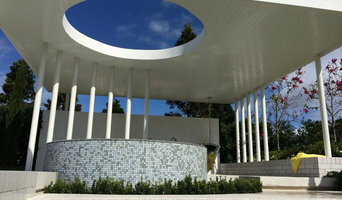 We specialise is custom build container pools from shipping containers, new fabrication and pre cast concrete (round). If your project requires a unique design including windows, fully tiled and exposed agg floors etc we can cater to your needs, Australia wide. Specialising in 'old to new' swimming pool makeovers with minimal impact on the surrounding environment. We have built our reputation on our eye for detail and our commitment to the best possible finish and customer satisfaction. Waters Edge Pool Solutions offers everything from small cosmetic pool repairs to major pool renovation works and project management including design, material sourcing and supply. With fresh design concepts and the highest quality workmanship in swimming pool beautification. Banora Pools (NSW) Pty. Ltd.
Banora Pools have been designing and building pools and spas for the last 30 years, and is an established and well-recognised pool construction business servicing the Gold Coast, Tweed Coast and Northern Rivers. When it comes to designing superior pools and spas for our customers – we are committed to quality. From initial consultation, throughout the pool construction to the landscaped finish, Banora Pools ensure every job is completed to the customers’ total satisfaction. Our team of professional and talented pool builders are masters at creating pools for every lifestyle and making sure your concrete or fibreglass swimming pool is the perfect fit for you and your family. We believe every home owner should have the opportunity to experience the joy that comes with swimming in your very own swimming pool. We are passionate about health and love educating our clients about the benefits of using Mineral pool alternatives. We are hear to give you the proven and scientific results from swimming in a Magnesium Mineral MangaPool® and we go one step further by combining it with Ozone Purification Systems. A swimming experience that provides you and your family with the health benefits of magnesium, is environmentally friendly and reduces chlorine, odour free and will save you time & money. Let us show you how. Burleigh Pools are builders of top quality pools and spas on the Gold Coast and in NSW Northern Rivers. Platinum Pools & Spas P/L is a family run business based at Yatala midway between the Gold Coast and Brisbane. The proprietors Keith and Sandra Boorer and their son David work together to build quality Inground concrete pools and spas. Keith has been building pools in Queensland for the past 10 years and worked with the prestigious pool company Aloha Pools in Melbourne for 12 years prior to that. Aloha are recognized as one of Australia’s leading pool builders and is a multi award company which features in almost every pool magazine published. It is with this quality training and expertise that Keith and family decided to bring their talents to Queensland.wedding-170 “We aim to bring that level of commitment and care to all our projects regardless of budget’’ says Keith and we’re building that reputation already. 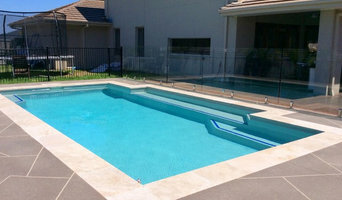 We aim to be the best pool builder in value and quality as well as customer satisfaction in Brisbane. Allow us to demonstrate the high degree of professionalism lacking in many Queensland pool builders. You will be pleasantly surprised by the speed and accuracy of our work and the communication we keep with our clients. Get a range of stylish glass products from Crystal Glassbuild. We guarantee exceptional service, quality products and outstanding designs at affordable prices. Crystal Glassbuild specialise in supply and installation of glass pool fencing, balustrades, staircase glass balustrades in a number of styles, including an extensive range of hardware to suit any applications. Our stylish designs of fully and semi frameless glass pool fences are integral part of outdoor architecture. We offer complete glass works including shower screens, splashbacks, architectural & curved glass as well as aluminium fencing and slat screening. We service the South-East Queensland region and we invite you to view our website displaying a portfolio of finished projects for satisfied customers. Call us for a free measure and quote. Australian and New Zealand pool builders continue to push the boundaries in terms of design. Infinity pools, for instance, are no longer reserved for top-end holiday resorts; and lap pools aren’t standalone additions to a backyard. 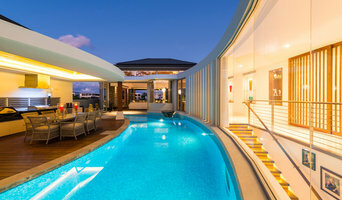 You can now get your feet wet in an infinity pool, lap pool or swim spa that is an integral part of your Palm Beach, Queensland home design. And, with improved technology, there are more low-maintenance, energy-efficient and sustainable options available. Whether you’re at the beginning stages of planning a pool or spa, renovating an existing one, or just need upkeep assistance, there’s a Palm Beach, Queensland pool specialist on Houzz who can help. After council approval, your contractor will commence construction, which can take up to two weeks for a fibreglass pool and longer for a concrete pool. Some companies in Palm Beach, Queensland extend their services to pool fencing, landscaping and the coordination of trades for filtration and heating equipment, as well as pool cleanings, water testing, renovations and equipment replacement or repairs. Here are some related professionals and vendors to complement the work of pools & spas: Garden & Landscape Supplies, Landscape Architects & Designers, Building Project Managers, Landscape Contractors & Gardeners, Solar Power Contractors. Find a Palm Beach, Queensland swimming pool and spa expert on Houzz.